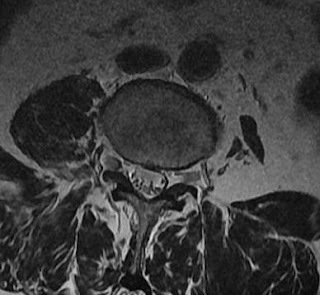 Incidental finding in MRI Lumbar spine of a 30 year old male complaining of mild low backache. He is a known case of poliomyelitis involving left lower limb during childhood. On neurological examination left lower limb wasting, hypotonia and areflexia. MRI Lumbar spine axial sections show severe atrophy of left side Psoas consistent with past history of Poliomyelitis. Cause of the muscle atrophy in Polio is still not completely clear, likely due to the premature degeneration of surviving motor neurons. Poliovirus has a predilection for the motor neurons of the anterior horns of the spinal cord, cell death followed by distal wallerian degeneration, denervation of muscles resulting in muscle weakness and atrophy. Relevant investigations: Detection of Oligoclonal immunoglobulin G and M bands in Csf and demonstration of Poliovirus like RNA sequences in Csf by Polymerase chain reaction. DDx: other causes of unilateral psoas atrophy with associated atrophy of other para spinal muscles need to be excluded like scoliosis, neoplasms, spondylosis with spinal stenosis. In normal or asymptomatic individuals, mild asymmetry of Psoas is a common finding appears to be a benign anatomical variant. Rx : No specific and successful treatment. Steroids, human growth hormone, pyridostigmine, Modafanil and bromocriptine all have been disappointing. Role of subcutaneous insulinlike growth factor-1 and IV immunoglobulin is doubtful. The late effects of Polio: Information For Health Care Providers, Commonwealth Department of Community Services and Health. ISBN 1-875412-05-0. Archived from the original on June 25, 2008. Retrieved 2008-08-23. W. Michael Scheld, Richard J. Whitley, Christina M. Marra..Infections of the Central Nervous System . Gonzalez H, Sunnerhagen KS, Sjoberg I, Kaponides G, Olsson T, Borg K. Intravenous immunoglobulin for post-polio syndrome: a randomised controlled trial. Lancet Neurol. Jun 2006;5(6):493-500.